Even though today is a work day for me, I am so excited that it's my birthday! See, I don't look at it as a year of getting older, but another year of blessings!! I am also so thankful that it is Memorial Day which means we are able to live in a free nation thanks to the brave men and women who have given their lives for our country. 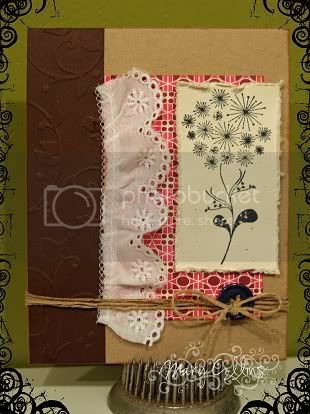 I used cardstock from PTI and We Are Memory Keepers: Old Glory, the old SU Delight in Life stamp set, Momento London Fog Ink, Tim Holtz Distress Ink, Button, and jute! I loved using my copics to color the little flower and make it have a little POP before spraying it with some tattered angels! You've gotta love it when your husband says, "Even though you spilled something on it, I kinda like it that way - looks like it was meant to happen"! *roll eyes* The wonderful sketch is from the Sketch Girl site, sketch #19 (SG19)! Yup, you read that read - Copic Certification that is! I am so excited and can't wait to know more about my much loved markers! Charleston, West Virginia - meet Softangelkisses! 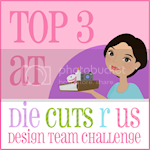 Die Cuts R Us has the sweet little creative space of A Crafty Little Place and their challenges alway allow me to "think outside the box"! This week was a sketch, and I can honestly say I have not done a border quite like that before! 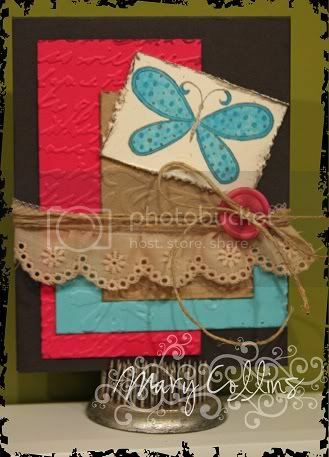 I used Cosmo Cricket papers along with PTI stamps and CTMH ink! Hello and Happy Saturday everyone! I hope that everyone's weekend is off to a wonderful start! Although I have been dealing with a headache, I have to say it has been a great weekend so far! Right now I am blessed to be getting a pedicure as I type this blog...well, my hubby is the one doing it, but that's the best :o) I love having some pretty toes to peep out of new sandals! This yucky headache has lingered for a couple of days, therefore so did this card. I still don't think I am totally satisfied with it, but as much as I will ever be, I suppose. Since I didn't feel too well, I tried to combine as many things as possible! 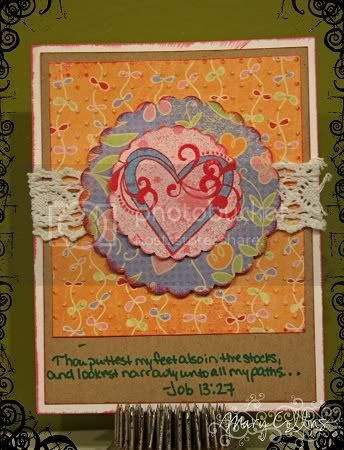 The sketch is from the lovely 2Sketches4You, while the Bible verse using the word "paths" is from the Bible Verse Thursday challenge #55 over at Christian Paper Crafts. Also, the heart is colored using copic markers, the challenge for Fun on Friday #54 over at Christan Paper Crafts as well! Also, this card was my first ever attempt at using glimmer mist. Well, I'm off to add these cards to the Prayer Shawl Ministry Basket! Thank you for stopping by, I sure hope you come back soon! You know, sunshine really is good for the body. Lately we have had so much sickness in our community, it got me to thinking. Although there is sickness around and the dreary weather seems to only add to the feeling that brings, there is something better. SONshine is good for the soul. Right now, the pastor of our church is sick and in the hospital. As a Christian man, he desires your prayers for healing so that he may continue to do God's work. Please join me in praying for Brother Donnie. 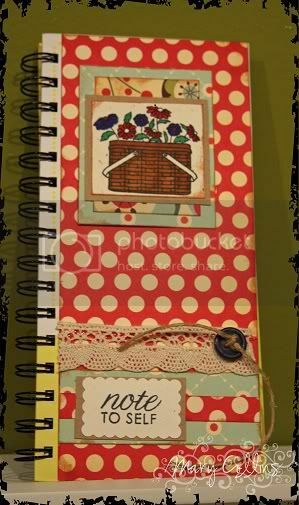 Today is Sketch Tuesday over at Christian Paper Crafts! 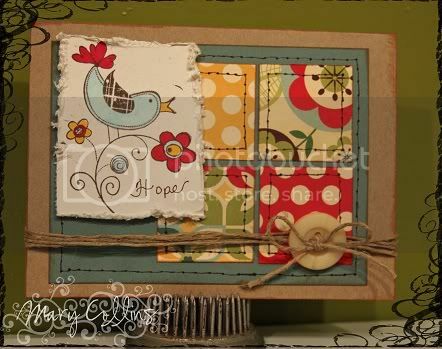 I used Basic Grey blush pp, PTI cardstock, Ippity Stamps, Copics (of course), jute and a button! Good morning! Monday's at my house are always hectic. No matter how much I try to do for the week ahead on Sunday, it seems the list for Monday mornings is never ending! Last night, we were without electricity for HOURS, so that really threw a kink into my "pre-planning". 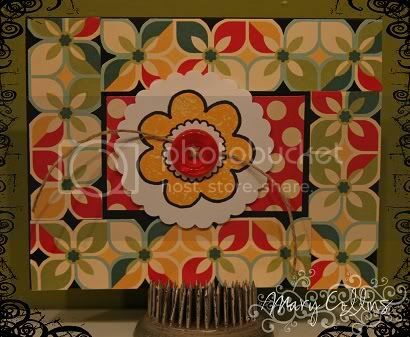 Nonetheless, today is color Monday over at Christian Paper Crafts and I feel like Miss Boo had me in mind when she picked out this color combo! 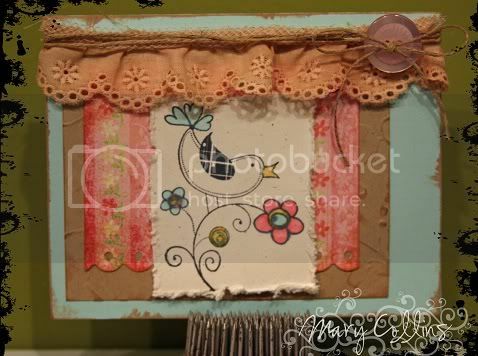 I just love the shabby, vintage feel to this card! I gave it to my mommy :o) The card uses PTI cardstocks and a Unity stamp, as well as my much loved Copics, jute, a button, and of course, Abby's tea-stained lace! First off, our featured artist today is twin2u2. You can visit her gallery by clicking her name, or clicking here. 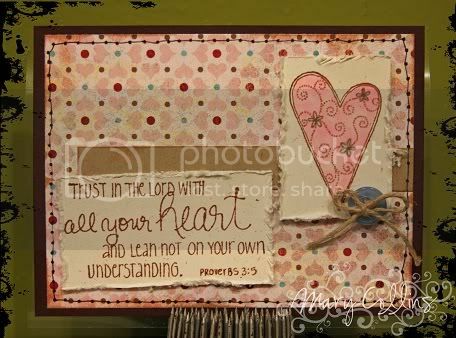 I am sure you will find lots of inspiration there, remember, keyword CAS52 if uploading into a gallery at Christian Paper Crafts and CPC-CAS52 if uploading somewhere else. 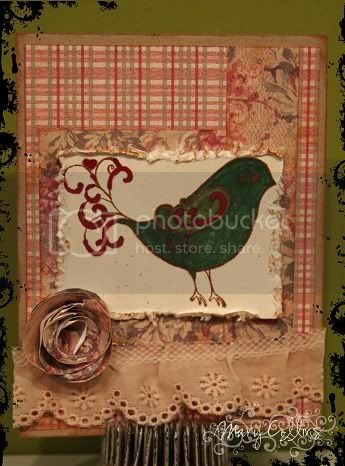 This card uses cardstock from PaperTreyInk, along with patterned papers from Hobby Lobby. The stamp is from Unity, in the Ippity line of stamps, which I sell for Relay for Life. You can find out more about that here. I colored the sweet little bird in with Copic Markers and the flower in the corner is handmade, too! The lace, now that lace is pretty special to me. You see, my three year old Abby has a new fascination. Wanna know what it is? She is truly a girl after her momma's heart, as she has taken up the hobby of "tea staining" and LOVES it!! Seriously. 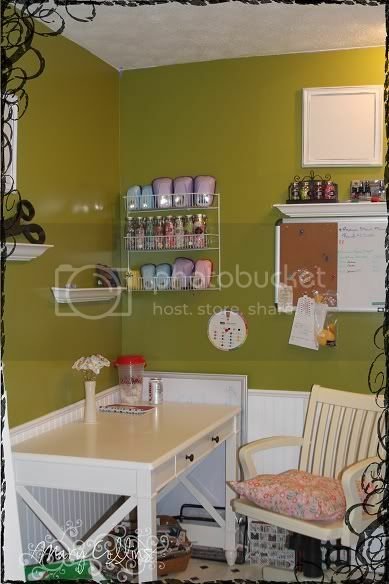 To keep her entertained for hours, brew a cup of tea, allow it to cool, and supply her with lace, ribbon, etc to "color"! My husband is truly amazed that I constantly find ways to keep her involved! Next up, is my project for Scripture Saturday today (Keyword SS45 at CPC and CPC-SS45 everywhere else). 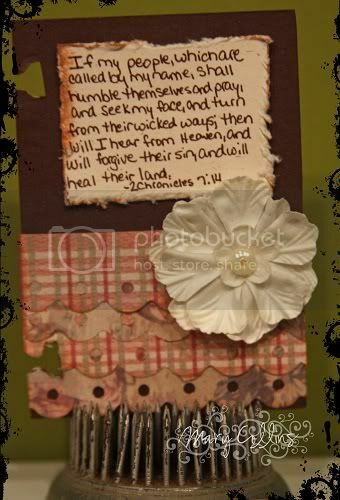 The scripture for today is 2nd Chronicles 7:14 - "If my people, which are called by my name, shall humble themselves, and pray, and seek my face, and turn from their wicked ways; then will I hear from Heaven, and will forgive their sin, and will heal their land." With the way things are in the world today, isn't it amazing that there in the Bible is the solution, but mankind as a whole will not follow it? The cute layout comes from the sketch over at 2Sketches4You this week. Today I used PTI cardstocks as my base, and layered on some of the same Hobby Lobby papers that I used in my card for CASE Artist Saturday. I also added a prima that has pearls for the center. I went for the older papers because they remind me of my grandmothers. They were so true to this verse, and apparently people of their generation were truer to it than those of the current generation. I am so happy that it is Finally Friday!! I have been so busy with work this week, I am actually excited about the chance to catch up on some homework :o) Oh, and some housework too LOL! My first card today is made following the sketch over at Die Cuts R Us' A Crafty Little Place! I love their sketches, they are always such fun to work with! For this, I used PTI carsdtock along with My Mind's Eye Papers. 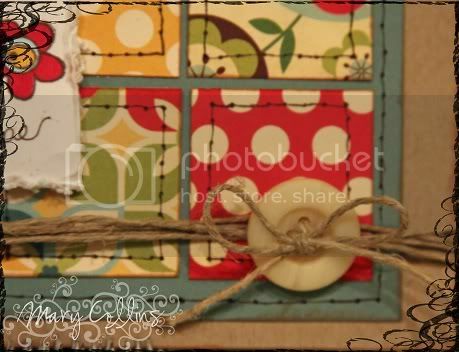 Hawaiian Shores Ink (by PTI), buttons, lace, and jute! Next up is Fun on Friday over at Christian Paper Crafts! And guess what, we have a guest hostess today so hop on over and check it out! Today's challenge....Anything altered! Everyone who knows me knows that one thing I love to do is write! You would think that as much as I do write, my handwriting would be better than it is LOL... I write all the time, making notes, writing lists, etc... Papers are PTI and Cosmo Cricket, I used Copics, PTI Vintage Picnic and Take Note Stamp Sets, and CTMH inks! As busy as my agenda is for today, I didn't know what to call Thursday, but I thought since I am starting it off crafty, it must be pretty 'rockin'! 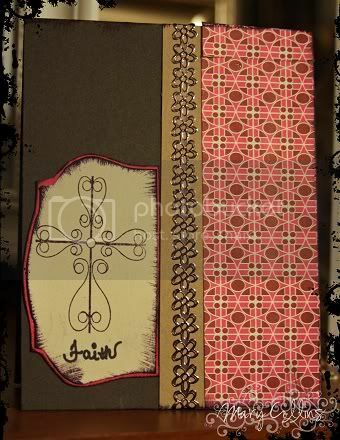 The Christian Paper Crafts Blog Hop yesterday where we featured Magenta Style Products was a total hit! If you missed it, just scroll down one post, or click here. I usually do not like to use my own handwriting on a card if it is a whole verse or something more than one word, however I decided to go ahead and give it a whirl on here. All of my cards lately are going to the Prayer Shawl Ministry at our church, so I think a little personalization might be just the key :o) Plus, making all of these cards for the shawls has been an EXCELLENT excuse to paper-craft and buy more supplies! As you see, the verse on the card is Matthew 8:3, which is talking about Jesus' healing hand. 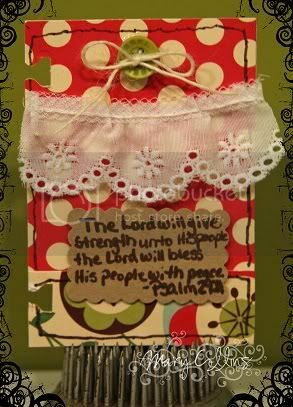 The Bible Verse Thursday challenge over at Christian Paper Crafts today is about "hands", so I thought this would be a wonderful verse to use on a card accompanying a Prayer Shawl. 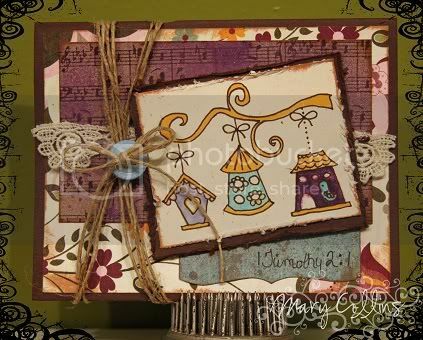 My wonderful sketch came from DigiDoodles and the colors are from the Stampin Sisters In Christ blog. 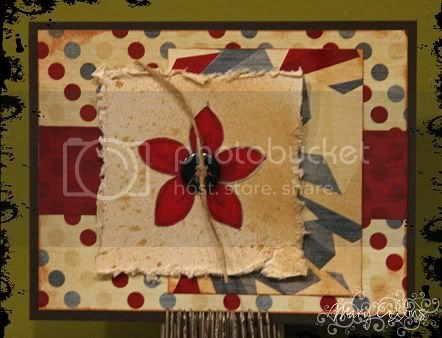 Items used: Randon Paper Scraps, PTI Kraft, Brown, and Rustic Cream CardStock, fabric trim, cuttlebug, CTMH ink, Ippity Stamp, bling, edge distressing tool. Good morning! 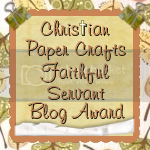 Welcome to the Christian Paper Crafts Blog Hop featuring our sponsor Magenta Style! If you have not checked out their products, what are you waiting for? These are not your ordinary "stickers" on the marker. The Magenta Style is a style of it's own in that I found they were not only stylish, but durable. They did not have the flimsy feel that none of us want to add to our creations. It will accompany one of the shawls we give away through the Prayer Shawl Ministry at our church. I wanted to add that the Magenta Style peel offs come in a variety of colors, however, this one was originally gold and did not match my card. I simply used a sharpie to color over the gold and LOVE the look it gave! You should have arrived here from Natalie's Blog. However, if you are just joining in on the hop, please start at Marcelle's Blog. 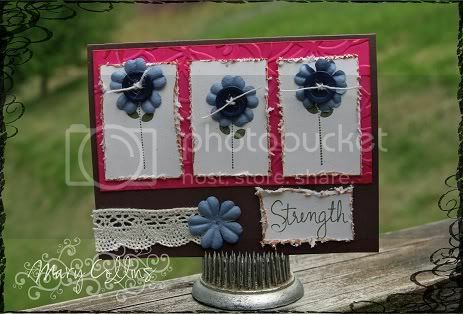 From here, go on over to Randi's Blog and see what she has in store for you using Magenta Style! Don't forget to hop all the way through in order to be eligible for the prize! I had so much fun making this card. Today is sketch Tuesday over at Christian Paper Crafts so I used that sketch to go by. All card materials are from PTI except the copics and the ink (CTMH). Tomorrow we are having a special little blog hop for Christian Paper Crafts, be sure to stop back in the morning to find out what it's all about! No matter how upbeat you try to be, I think Monday's always have the same feeling to them... The beginning of the work week and it means the weekend is officially over. An easy way to ease the pain of the weekend being over is to dive into creating! Today is Color Monday over at Christian Paper Crafts with our sweet Miss Boo. I had so much fun with this, and since Jen was talking about May flowers in her description, I couldn't help but to use some flowers on my card! With the colors for today purple, green, white, and an optional neutral, they screamed flowers to me as well! Also, the wonderful sketch came from Die Cuts R Us! They are in their new little "home" on the web, A Crafty Little Place and I just love it when they have sketch challenges, so I had to play along!! 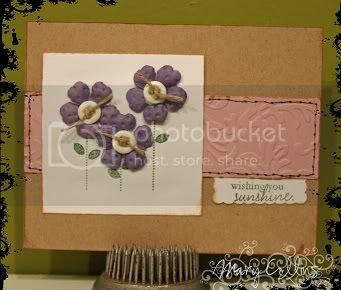 The stamp set used it PTI Blooming Button Bits and the cardstock is PTI as well. The ink, well that's some good ole SU Green Galore! 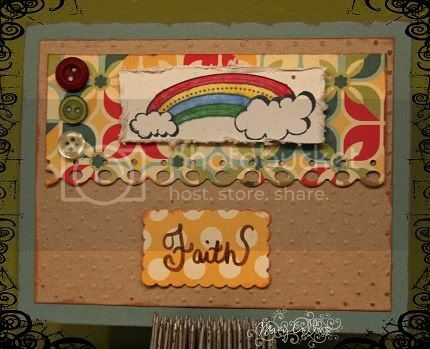 This little creation is for ST52 over at Christian Paper Crafts. I used PTI supplies except the Primas :o) The Sketch is actually from a couple of weeks ago, but I had misplaced my jump drive at that time and was finishing up my Bachelor's degree, so I really didn't have the spare time to look/redo! Today I have a couple of little creations to share with you. The Prayer Shawl ministry at church is such a blessing not only to those of us who are creating the shawls, but also to those who are receiving them. Here is another shawl that I created with prayer this week. I am not sure who it will go to, but it is full of prayers. I created it using Peaches and Cream brand yarn. I had never worked with it before and it was oh so easy to use! 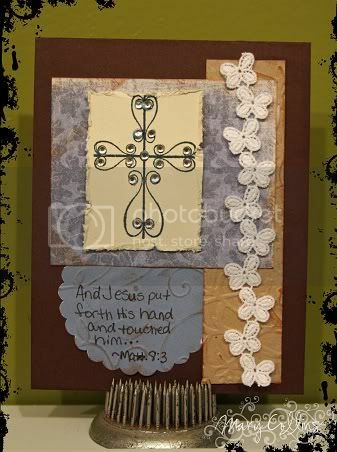 Over at Christian Paper Crafts, today is both Scripture Saturday and CASE Artist Saturday. For Scripture Saturday, our verse is Psalm 29:11. I decided to make an ATC for my ATC holder that sits on my desk at work. I thought this little verse is a great reminded of what God does for us, especially on days we need reminded the most. "The Lord will give strength unto His people; the Lord will bless Hid people with peace". The featured artists today for CASE artist Saturday is Rose Miller. 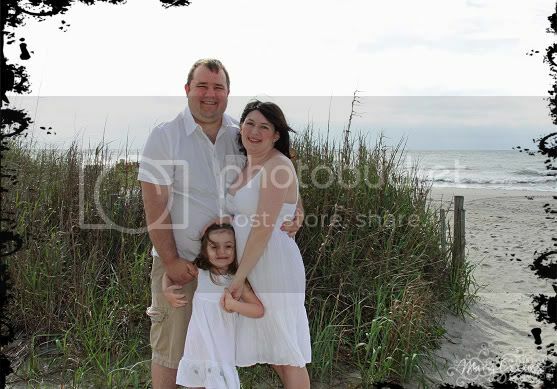 You can see Rose's gallery at CPC by clicking here. The card I decided to CASE today can be seen by clicking here. After I started on this card, I realized that I used the same color combo and papers that I did for last weeks CASE that I did!! I guess it just shows that I am in a "Summer time" mood and these colors scream Summer to me and beg to be used!! Yes, that would be today! I am officially a graduate of Indiana Wesleyan University with my Bachelor's of Science in Nursing degree. Although I have been a nurse for years, finishing my Bachelor's degree was the first step in achieving my dream of obtaining my Masters to be a Nurse Practitioner! IWU is a Christian school, which was so cool because the first college I went to also had a Christian emphasis. If you couldn't tell, I'm a little excited! Some things that have been going on before we get to the crafty business of it. The church where I attend now has a Prayer Shawl Ministry that I am blessed to be a part of. 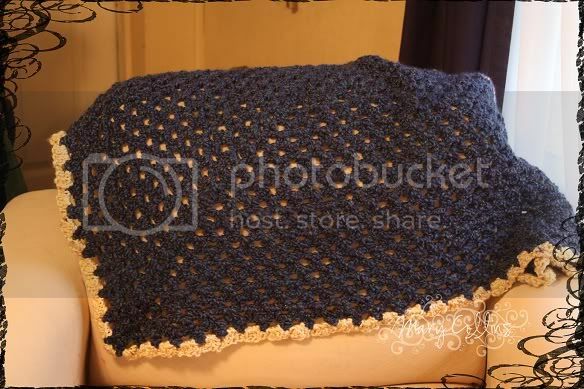 Here is one of the shawls that I crocheted for the ministry. We present them to those who have a need, whether it is physical sickness, emotional, those suffering loss, etc. 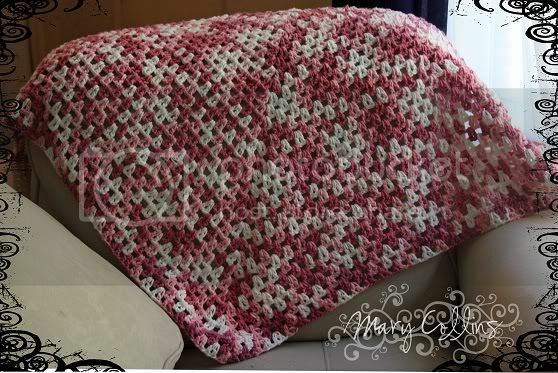 This one is made for a special friend's sister-in-law who is fighting breast cancer. She is a courageous Christian and is trusting in God for her healing. Please join me in praying for her, especially as she is only 35 and has three young children as well as a spouse. Now, on to the paper-crafty goodness! 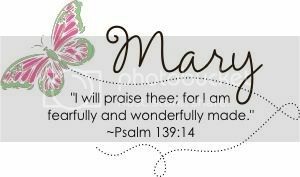 Today is of course Scripture Saturday and CASE Artist Saturday over at Christian Paper Crafts! If you have not stopped by and become a member, I urge you to do so. If you are unfamiliar with CPC, check it out, you will not regret it! Our featured artist today is Bernadette. The card of hers that I decided to CASE can be seen by clicking here. When I saw the little squares, I immediately thought of quilting and fell in love! 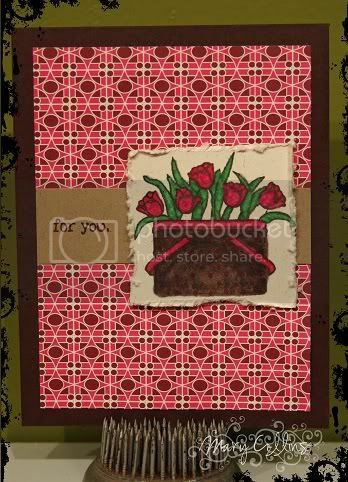 This card also follows along with Cindy's Fun on Friday challenge for yesterday (FOF51). You can read all about that here. In the picture below, you can see a better close up of some of the detail! 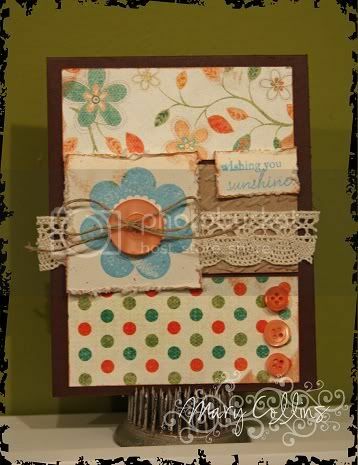 I used PTI cardstock along with Cosmo Cricket! Unity Stamps and copic markers. Next is what I created for Scripture Saturday. I love to keep verse close by whether in my office at work or my new office at home. 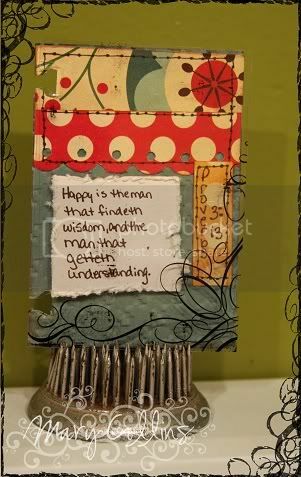 I find that if I begin to get aggravated, I can grab my ATC holder and look through it... A smile and prayer comes up in no time after that! Today's Scripture is Proverbs 3:13, from any version you chose. I am more familiar with the King James or New King James version, so those are what I use the most. I also decided to use a little Fun on Friday theme on here as well! I hope you enjoy!